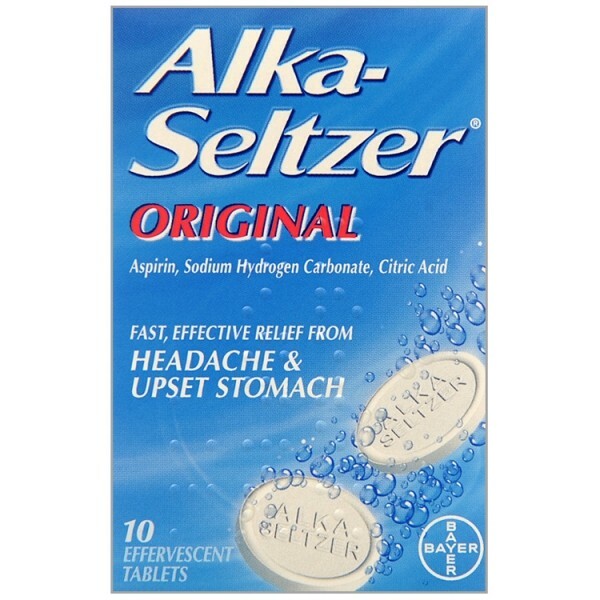 Alka-Seltzer Original Tablets for fast and effective relief from headache with upset stomach particularly when due to too much to eat or drink. Especially effective when taken before bed and again in the morning. They can also be used to relieve period pains neuralgia rheumatic and muscular ache and pains and symptoms of cold and flu such as feverishness. Each Effervescent tablet contains Aspirin 324 mg, Sodium Hydrogen Carbonate 1744mg, Citric acid 965mg. Sodium content 445mg per tablet. Adults and children aged 16 and over: Take two tablets dissolved in water every 4 hours, if necessary. Do not exceed eight tablets in a 24-hour period. Not suitable for children under 16 years of age. Always read the information provided on the enclosed Patient Information Leaflet before taking this medicine.